Common in both forests and urban areas, the native flowering dogwood is a small tree (up to 40 feet) that is known for the beautiful white bracts found around its flowers in the shape of a cross. The red berries of the dogwood are a favorite of birds. 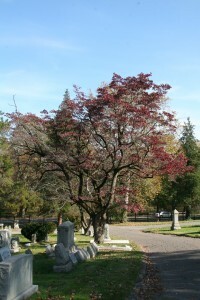 However, anthracnose fungus has killed many dogwood trees throughout Delaware in recent years. The wood is very hard and was once used for tool handles. Dogwood flowers often appear in early spring.Clusters of bright-red fruit arrive in October. The “true” flower of the dogwood tree is in the center of the cross-shaped bracts.